La Olmeda Roman Villa was discovered while doing some agricultural work in a land near Pedrosa de la Vega (Palencia), at the beginning of the summer in 1968. The tractor tripped over the remains of an ancient wall and that was the starting point of the archaeological research. The mystery was cleared up with the discovery of a splendid Late Roman palace: rooms, corridors, porches…, a whole complex whose peak, 1600 years ago, has found its way to the present by chance. La Olmeda is one of the most important archaeological sites in the Spanish Roman world. It is a big rural mansion or domus of the Late Roman Empire (4th century A.D.), which main building or pars urbana – square and flanked by towers – is arranged around a central courtyard with peristyle that opens towards the different rooms, most of them paved with mosaics. This palatial villa covers an area of 4400 m2 with 35 rooms divided between the main house and the Baths complex and 26 of them are decorated with 1450 m2 of polychrome mosaics preserved in situ. The archaeological site was declared Asset of Cultural Interest on 3rd April 1996. The monumental façade of the building, flanked by two octagonal towers, is in the South. After passing through it, we come to the main hall of the palace (V-03) where the mosaic has been preserved almost intact. At the back of the hall, two columns mark the division between it and a perpendicular gallery, which is the Southern part of the peristyle. This peristyle also has beautiful mosaics and the main rooms of the villa open towards it. The Eastern, the most important and sumptuous rooms, have been identified as a bedroom, a small dining room (V-13) and a reception room. All of them have splendid mosaics and under floor heating system or Hypocaustum (V-16). Among the Western rooms, the large dining room or Triclinium (V-32) is the main one. It was reformed during the Roman age, which increases its archaeological interest. On the other hand, the rooms along the Northern and Southern galleries have been identified as rooms for servants, like kitchens and storerooms of the villa, with simple floors made with hardened earth floors and Opus Signinum (mixture of lime mortar and ceramic pieces). In addition, remains of staircase have been found in both areas, which led to a second floor, not conserved at present. In this second floor were found mosaic remains, consolidated and exposed on metal supports in some areas of the archaeological site. Finally, the North façade of the building (V-40) would also have a porch, reinforced with buttresses and flanked by square towers. Its lobby (V-22), paved with hardened earth floor, confirm a secondary or service use. The baths or Balneum of La Olmeda Roman Villa are a distinguished area in the Western part of the main residence or pars urbana. They were already identified in the excavations performed by Pedro de Palol and Javier Cortes in 1970. 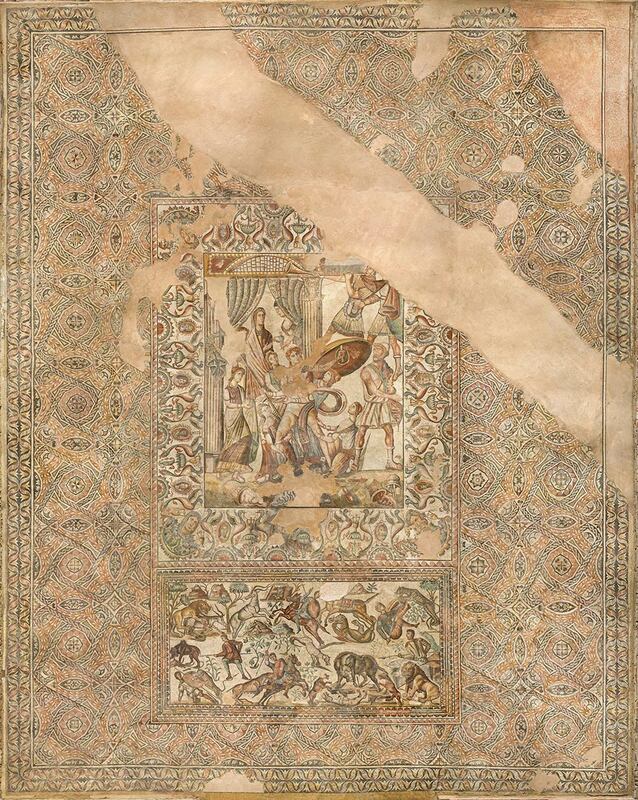 Since then, there have been a number of works, most recently in 2013, whose primary aim was to delimitate the external perimeter of the complex, the excavations of the entire area, investigations, protection and consolidation of the structures and the Opus Tessellatum floors discovered. In conclusion, all these works show a building, with over 900 m2 large, attached to the palace of the villa. The rooms are organized in two areas at both sides of the access corridor from the palace toward the baths. This corridor, with over 40 metres long, was covered and probably used such a kind of palaestra or training area. The Southern area is made up of a big rounded room (B-10) with corners in angle, maybe a warm room, provided with an underground heating system. There are four small rectangular rooms attached to it, without a heating system, whose possibly were used for massages. The Northern area is the place where the more specific rooms of the thermal area are located. To date, archaeologists have identified: A big square room with rounded corners and a bench in some areas, maybe an apodyterium or dressing-room (B-02), which also has an oval bathtub of immersion in one of the corners, with stairs inside; At the North of apodyterium there is an area trefoil-shaped and steps down, used as a pool of cold water or frigidarium (B-03); At the West of the dressing-room were excavated in 2010 the rooms of the baths with warm and hot water (tepidaria and caldaria) and they have heating systems and a small rectangular area, added at the North, where there was the furnace or praefurnium of the baths and the fuel store or propnigeum. In the SE area there is a smaller room with a deep wastepipe and ceramic floor tiles. It could have been used as laetrinae (B-5). The comprehension of everyday life in the Lower Roman Empire can be completed with the visit to the Museum of the Villa in Saldaña ,a village 6 kilometers away from La Olmeda. There, you may contemplate the collection of objects found in the ruins: coins, terra sigillata fine ware pottery, tools of farmers and artisans, bronze tacks of their fast horses and fragile greenish glasses. These ones were found among the burial goods put close to the corpses inside the tombs of the necropolis.